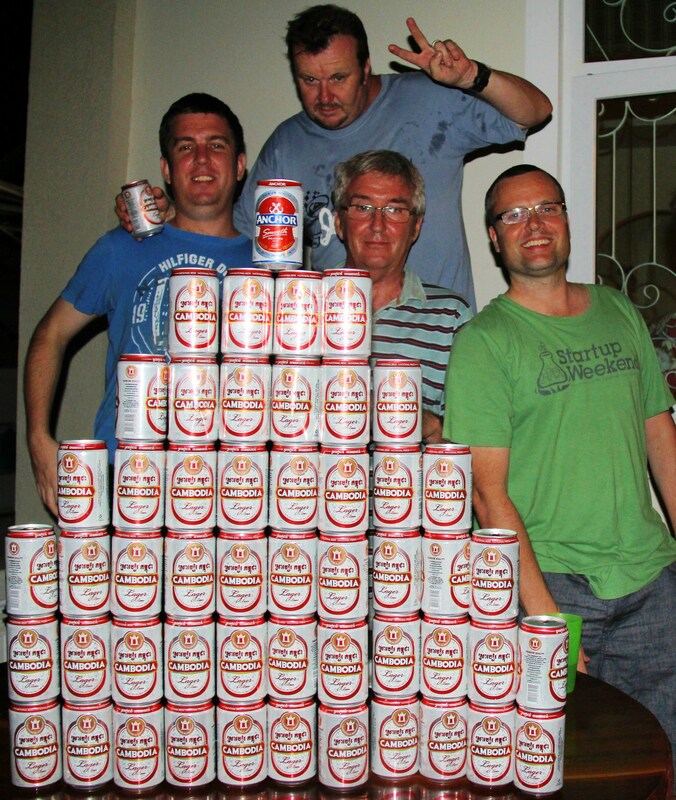 This might not be the best way to prepare for project managing in the bush…..
Been a very busy weekend. Friday night we had our gates blocked by a wedding tent. To escape the blaring music we headed over to Chris and Aya’s house after work and …well….the above picture tells a thousand cans…er..words. 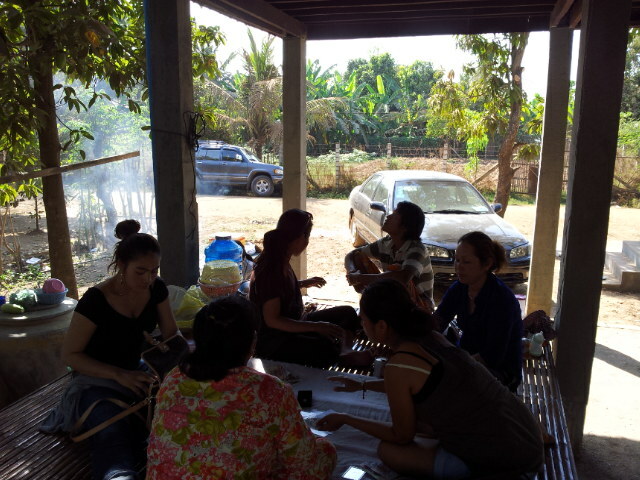 On arrival home, I was trying to make my way discreetly through the tables of now well lubricated khmer male wedding goers knowing full well that if I caught the eye of just one I would have to sit down and drink more beer before I went to bed. I made it about a metre before I caught an eye. DAMN IT ! So I basically had to join the table of 8 guys who were eating grilled buffalo and driking tins like the end of the world was coming. Good guys but the following day was rough rough rough. Yesterday we went out to Mum’s house to check on progress. 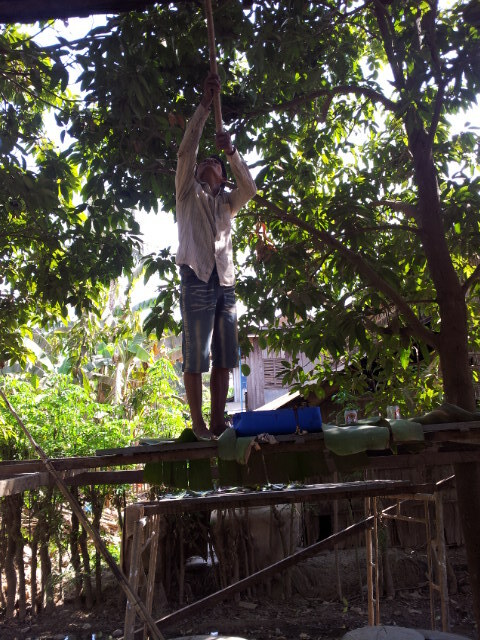 The floor under the house has been compacted and cemented in readiness for tiling and about an hour after we arrived so too did 90 boxes of Vietnamese terracotta tiles which needed to be unloaded in the morning sun. PHEW. The house has also been given a coat of paint. It is a dark- red / brown which initially i did not like when I saw it going on so I got them to add some black to darken it further. I had wanted to actually oil the house but it was going to be very expensive so the girls chose the paint in my absence. i think with time it will calm down a bit and fade. 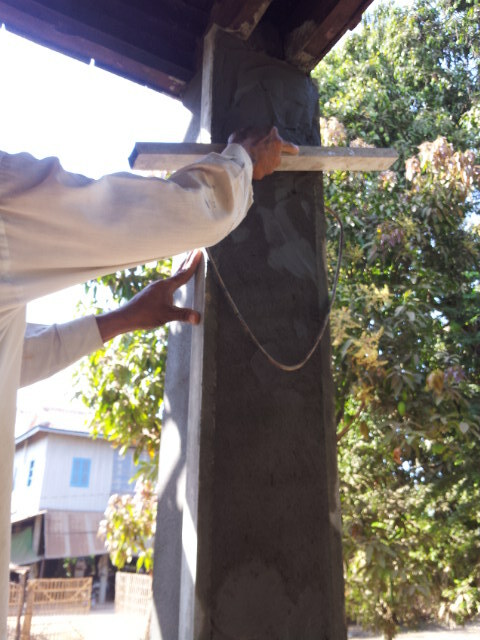 The builders have also starter rendering all the columns to make them look nice. Quite an interesting little process to watch. Lengths of lightweight box steel are pinned onto the columns to create the face, plum-bobbed straight and the mortar is simply screeded into the space and smoothed off. Grace was doing her own little bit of construction. 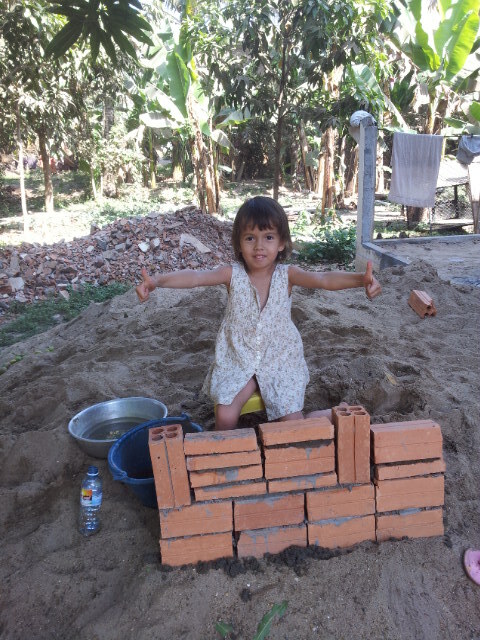 With her buckets and a spoon she expertly whipped up a wall and I have to say I was one incredibly proud father. After some lunch Danay and I took a drive further north to see what the lay of the land was and then I took Grace for a swim in the river while the women played cards. For the second time in a row Jirra managed to find something absolutely foul and disgusting to roll in and the stench was unbelievable. She had to be washed and shampooed. Leakhana came down for a swim and after a few wines was having trouble navigating the soft sand which was amusing. 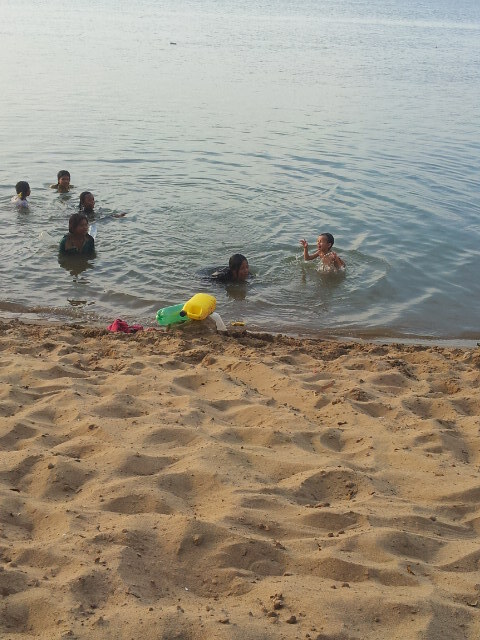 The kids had a great time swimming at our beach and it was soon time to head back to phnom penh.